Photo of the 2017 nominees. Rear: Tracey Rogers, Tracy Fedak, Anne Phipps, Nancy Irwin, and Mary Pat McSharry. Front: Jim & Patti Schwartz, Jean Mineo, and Lily Doctoroff. Do you know someone in Medfield who volunteers countless time and energy to a worthy community cause or initiative? If so, now is your chance to recognize that person as part of the Medfield Foundation volunteer awards. Anyone interested in submitting a nomination for one of the 2018 Medfield Foundation volunteer awards can complete the form on-line at http://medfieldfoundation.org/volunteer/. Completed forms must be submitted by February 28, 2018. 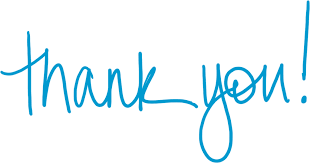 The MFi’s 2018 volunteer recognition reception is scheduled for 3 -5 PM on Sunday, April 8 at The Center. The public is invited, and is assured to be moved by the volunteers’ stories of what they do. Since 2008 almost over 100 residents have been nominated for recognition by their fellow residents – this year let us include your favorite volunteer. The Medfield Foundation, Inc. is a volunteer-run private nonprofit, tax deductible 501(c)(3) corporation created in 2001 to raises private monies for public purposes in the Town of Medfield. The MFi allows donors to designate their donations for particular purposes. The MFi also allows motivated groups to raise monies for Medfield purposes under the rubric of the Medfield Foundation. To date, the MFi has raised over $1,800,000.00 for the Town of Medfield, recently started an endowed fund (the MFi Legacy Fund), and celebrated over one hundred volunteers. Earlier this afternoon, Gov. Charlie Baker submitted a $40.9 billion fiscal 2019 state budget plan with the Legislature, proposing a spending blueprint that would increase overall state expenditures by 2.6 percent, as the Administration seeks to close an ongoing structural budget deficit by restraining spending across the board and placing an estimated $96 million into the state’s rainy day fund. The budget relies on $95 million in one-time revenues. As Gov. 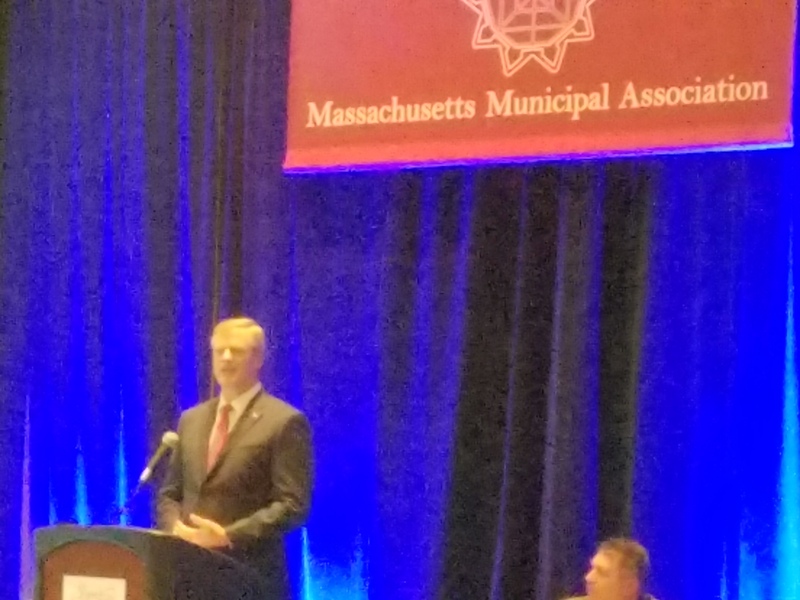 Baker pledged to local officials on Jan. 19 at the MMA’s Annual Meeting, his budget includes a $37.2 million increase in Unrestricted General Government Aid, and $103.6 million more for Chapter 70 school aid. The Gov.’s proposal for Chapter 70 aid includes a minimum aid increase of $20-per-student, full funding of the foundation budget requirements, and continued implementation of the “target share” equity provisions. The foundation budget calculation would continue modest progress to implement the Foundation Budget Review Commission’s recommendation to use a more realistic factor for the cost of employee health insurance in school systems. Most other municipal and education aid accounts in the Governor’s budget proposal would remain at fiscal 2018 levels. The special education circuit breaker would increase by $10 million, but would remain underfunded by about $20 million. Payments-in-lieu of taxes ($26.8M), regional school transportation ($61.5M), Shannon anti-gang grants ($6M), McKinney-Vento reimbursements ($8.1M) and METCO ($20.6M) would all be level-funded at fiscal 2018 amounts. The Governor would level-fund charter school reimbursements at $80.5 million, a painful proposal that is approximately $85 million below the amount necessary to fully fund the statutory formula that is designed to offset a portion of the amount that communities are required to transfer to charter schools. Level-funding this account would lead to the continued and growing diversion of Chapter 70 funds away from municipally operated school districts, and place greater strain on the districts that serve 96% of public school children. In a major victory for cities and towns, House 2 (the Governor’s fiscal 2019 budget submission) would provide $1.1 billion for UGGA, a $37.2 million increase over current funding. This fulfills one of Gov. Baker’s major promises to increase direct municipal aid by the same rate of growth as state tax revenues. The $37.2 million would increase UGGA funding by 3.5 percent, the same rate of growth projected for state tax revenues. Every city and town would see their UGGA funding increase by this 3.5 percent growth rate. The Governor’s budget submission proposes a small 2.2 percent increase in Chapter 70 education aid of $103.6 million, providing every city, town and school district with a minimum increase of $20 per student. The Governor’s budget would continue to implement the target share provisions enacted in 2007. The Governor’s budget includes a partial reflection of one of the Foundation Budget Review Commission’s key recommendations, which is updating the foundation budget to reflect the cost of employee health insurance. But this adjustment in the foundation budget is not enough to increase aid to many districts. A high majority of cities, towns and districts would only receive an increase of $20 per student under the Governor’s budget. This below-inflation increase is too low, and would force communities to reduce school programs or further shift funds from the municipal side of the budget. Please ask your Legislators to support a funding increase for Chapter 70 school aid that ensures that all schools receive a suitable and appropriate increase in fiscal 2019, which the MMA believes should be at least $100 per student. The MMA also strongly supports implementation of all of the recommendations of the Foundation Budget Review Commission to update the Chapter 70 “foundation budget” minimum spending standards for special education and employee health insurance, and to add to the spending standard a measure of recognition for the cost of services for low-income, English Language Learner (ELL) and other students who would benefit from more intensive services. The Commission recommended phasing in the changes over a four-year period, a position the MMA supports as well. Increasing minimum aid and fixing the inadequacies in the foundation formula are essential. The Governor’s budget would add $9.9 million to fund the Special Education Circuit Breaker program at $291.1 million. Because special education costs are expected to rise in fiscal 2019, this means that the Governor’s budget underfunds reimbursements by approximately $20 million. This is a vital account that every city, town and school district relies on to fund state-mandated services. The MMA will again be asking lawmakers to ensure full funding in fiscal 2019. As noted above, the Governor would level-fund charter school reimbursements at $80.5 million, far below the amount necessary to fully fund the statutory formula that was originally established to offset a portion of the funding that communities are required to transfer to charter schools. The fiscal 2018 funding level is $73 million BELOW what is necessary to fund the reimbursement formula that is written into state law, so it is clear that the shortfall will grow significantly in fiscal 2019. MMA’s estimate is that this account is at least $85 below what is necessary. This would lead to the continued and growing diversion of Chapter 70 funds away from municipally operated school districts, and place greater strain on the districts that serve 96% of public school children. Solving the charter school funding problem must be a major priority during the budget debate. Gov. Baker’s budget submission would level-fund regional transportation reimbursements at the $61.5 million amount. This will be a hardship for virtually all communities in regional districts. Reimbursements for transportation of out-of-district vocational students remains significantly underfunded at $242K. Increasing these accounts is a priority for cities and towns. The Governor’s budget would level-fund reimbursements for the transportation of homeless students at $8.1 million. The impact of this funding level will vary from community-to-community depending on the number of homeless families that remain sheltered in local hotels and motels. The Administration has been successful in reducing the number of homeless students who are dislocated from their original district, but those communities that continue to provide transportation to many students may continue to see shortfalls. The Governor’s budget would level fund PILOT payments at $26.77 million, Shannon anti-gang grants at $6 million, and fund library grant programs at $19.3 million (up $191K). House 2 includes an outside section (section 32) that would subject Airbnb and other short-term rentals to the local room occupancy excise tax. However, this would only apply in cases where the property is rented for 150 days or more. The MMA strongly supports extending the room occupancy excise to ALL short-term rentals. The 150-day threshold would continue to shield a large percentage of seasonal and short-term rentals from taxation, and would not close the loophole that exists now. A huge heartfelt thank you to Middlesex Savings Bank for their support and recognition! Read more about their $1.2 million donation here! Please visit www.medfieldcoalition.org to learn about our foundation and the educational grants we fund to all five of Medfield’s public schools. MCPE’s Treasured Experiences Auction is happening now! Click here to bid on over 170 priceless experiences generously donated by Medfield K-12 teachers, administrators, and community members. Act quickly! 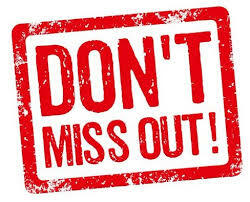 This online auction ends on Friday, February 2nd! Bid Now! The following are our $ figures in the Governor’s proposed budget that was released today. Our state aid is up about $101K, and our assessments are down about $40K. The Governor committed to an increase that matches the state’s 3.5% projected revenue increase, but that only applies to the unrestricted general governmental aid category, which has gone up 3.5%. If all of our state monies went up 3.5%, we would be getting $272K more, instead of $101K more. As time goes by, the state seems to transfer more of the cost of providing municipal services to the towns. Gus and i attended the Massachusetts Municipal Association’s annual meeting both yesterday and today at the Hynes Convention Center. Governor Baker told us yesterday that his administration will continue to increase the state local aid by the same percentage that state revenues increase, meaning that it will increase 3.5% next year, because that is the consensus projection, even though the revenue increases may not actually be that high. Senators Warren and Markey stayed in DC to deal with the government shutdown, and appeared only by videos. Lots of good information from other selectmen, state officials, and service providers. 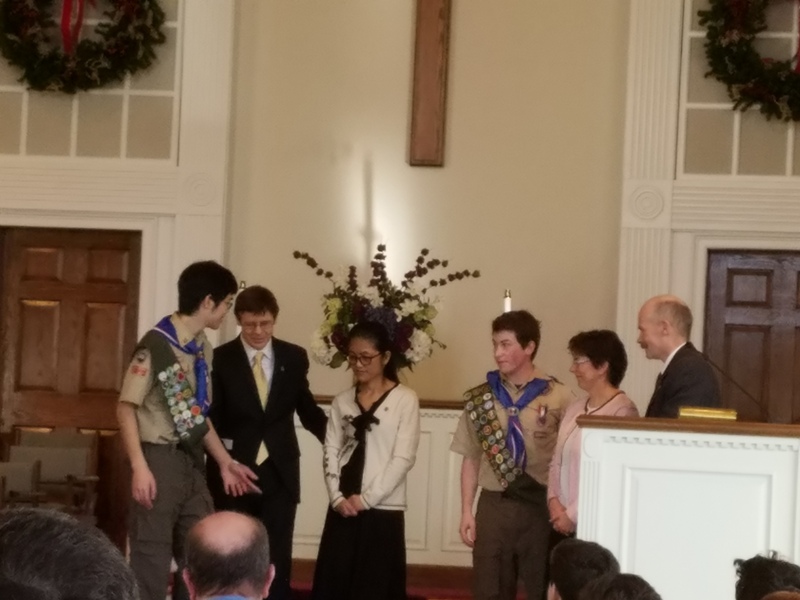 Daniel Whelan and Tadhg Matthews this afternoon were celebrated at their Eagle Scout Court of Honor at the UCC this afternoon. Here they are shown with their parents.